Stump Intergalactic Wrestling is once again broadcasting the Turtles’ battle – only this time it’s a fight to find the Turnstone. 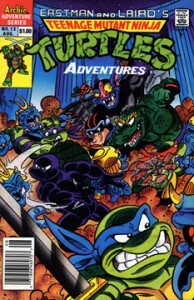 The TMNT and their allies (Leatherhead, Trap, Wingnut and Screwloose) are skirmishing with the the insect warriors sent by the creepy alien queen named Maligna. The Turtles, Leatherhead and Trap aren’t having too much trouble battling the bugs in hand to hand combat, although they’re vastly outnumbered. Wingnut and Screwloose fly off to look for Krang. Leatherhead is eventually grabbed by two bugs and sent flying out of the arena where the battle has been taking place. Wingnut and Screwloose find Shredder, Bebop and Rocksteady flying in their hovercars and attack them. On the ground, Trap and the Turtles mop up the rest of the insect warriors and begin to celebrate their victory… just a bit too early, as Krang arrives in his spaceship and begins firing at our heroes. Cherubae takes the Turnstone and uses its power to summon Rocksteady, Bebop, Shredder and Krang, who appear before her held immobile inside of a force field. She then uses the device’s vast abilities to destroy all of Stump’s TV cameras… much to the disappointment of the enraptured audience. Finally, Cherubae uses the power of the Turnstone to banish their foes. She sends Bebop and Rocksteady to a jungle world inhabited only by wild animals – a fate the pair seem to truly enjoy. Shredder is sent to a prison on Earth, where he vows vengeance. Krang is sent to Morbus – a toxic waste dumpworld. Cherubae then makes the Turnstone vanish out of existence, explaining that its power was too great for anyone to wield. The TMNT complain that she could have sent them home before doing that, but Cherubae explains that they’ll be traveling back to Earth with Cudley the Cowlick.